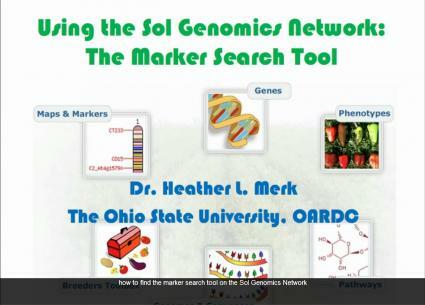 This video tutorial introduces the marker search tool ("Markers") in the breeders toolbox of the Sol Genomics Network (SGN). A pdf version of the tutorial is available at the bottom of the page. The Sol Genomics Network, also referred to as “SGN", is home to numerous databases with a wealth of Solanaceae related information including molecular markers, genetic and physical maps, metabolic pathways, genes, and entire genomes. Although SGN was developed with researchers in mind, there are tools specifically designed for plant breeders. These tools can be found in the “Breeders Toolbox" (Fig. 1). This tutorial focuses on the marker search tool ("Markers"). Figure 1. 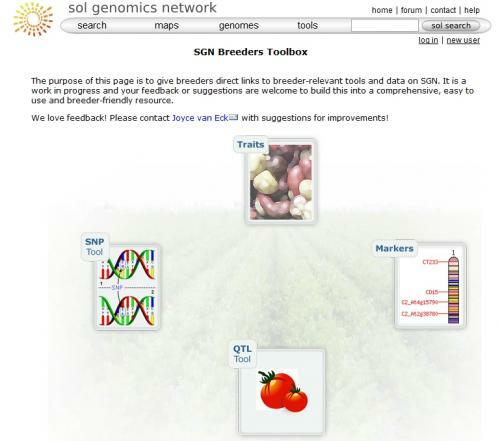 Screenshot of the Sol Genomics Network (SGN) breeders toolbox home page. Screenshot credit: Heather Merk, The Ohio State University. The Sol Genomics Network [Online]. Available at: solgenomics.net/ (verified 12 May 2012).